Several dogs were killed and their owner critically injured in a fire at a northwest side home that neighbors say has been a problem property for years. "They rescued eight. I saw a crate full of dead puppies, dogs come out with the firemen," said Jelena Novak, who lives on the 5000 block of West Winona Street, where the fire broke out Monday afternoon. The homeowner, a man in his 50s, ran out of the house when the fire started but tried to go back inside, fire department spokesman Larry Langford said. An off-duty firefighter who happened to be in the area kept him out of the burning home until crews arrived. 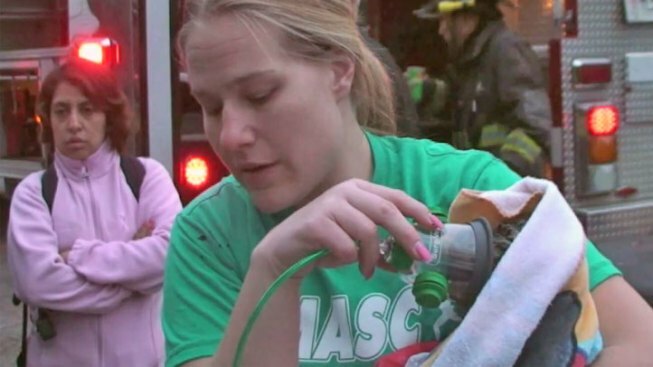 Sights & sounds: Volunteers from the neighborhood and animal care organizations spring into action after home with several cats, dogs catches fire. The homeowner’s clothing was "all burned up" when firefighters arrived, Langford said. He suffered "substantial" burns and was taken to Loyola University Medical Center in serious-to-critical condition. No one else was hurt in the blaze, but crews initially put the number of dogs rescued from the first floor and basement at 10. 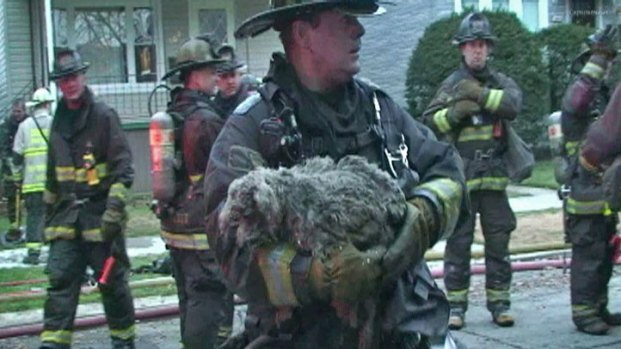 Firefighters brought the animals -- some unconscious -- out of the building in blankets and used oxygen masks specially made for pets to attempt to revive them. "They're terrified. They are so scared. They're covered in soot, covered in glass, some of them. [They're] wet, cold, just shaking," said Michelle Rycraft. Rycraft said she lives down the street and is a nanny for many of the children who attend a nearby school. She took off running toward the school building when she saw the smoke and the flames. Novak said the man and his dogs has been an issue for years. "We've lived here for 20 years, we've called animal control every year ... They're not bathed. They live in their own, you know, urine and filth and what-not," she said, adding that she heard a fireman say 19 dogs had been pulled from the home. "It's awful to say, I feel awful for [the homeowner] but when I saw the dead dogs I broke down and I was sobbing," she said. Volunteers from the neighborhood and Chicago Animal Care & Control were making arrangements to care for the injured animals. "People come first. People do come first. But we all love dogs. If we can save them, we've got to try and save them too," said Todd Anderson with Wright-Way Rescue. The home where the fire started was heavily damaged, and lost its roof. The home next door also sustained substantial fire damage, but was still standing. Crews were working Monday evening to remove debris from the homes. "The chief on the scene says he definitely is a hoarder and they’re throwing a lot of things out of the house,” Langford said. Fire crews have responded to the home before, including once to douse a burn pit in the backyard.